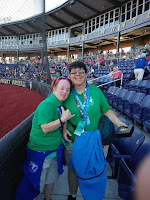 Ginny Petrillo-Sparcino will be speaking at the E2 Expo regarding her experiences in the Special Olympics USA games. She has participated in and won medals in in bocce, bowling, swimming, track and field, basketball and roller-skating. She will be speaking at 11 AM October 13th at E2.